Our company, Taiwan Advance Bio-pharmaceutical Inc. (TABP), we have dedicated in food safety diagnostic product development for over 30 years. Based on the platforms of ELISA and lateral flow technologies, the food checking categories including diary, livestock, poultry, seafood, egg, and so on. We have achieve a outstand performance in terms of assisting both government and private companies in veterinary drug residue monitor and control. In order to assist you in exploiting new business opportunities, TABP is able to offer a full-featured small laboratory counseling service for local food safety. 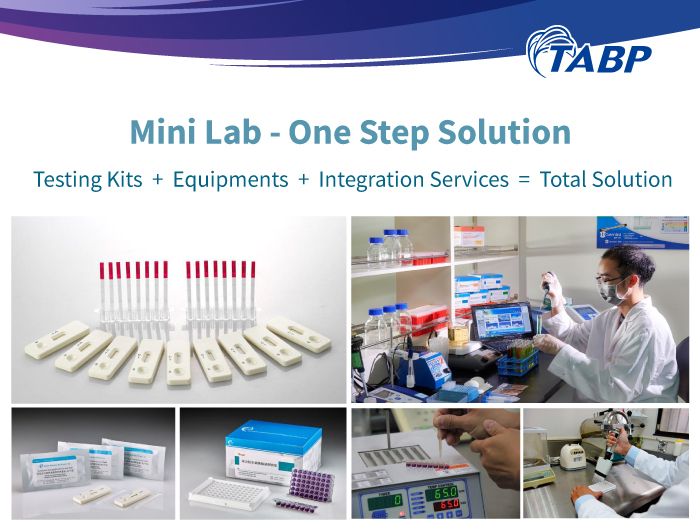 For a more professional inspection environment, TABP can offer all necessary equipment and facilities in the simple laboratory as well.